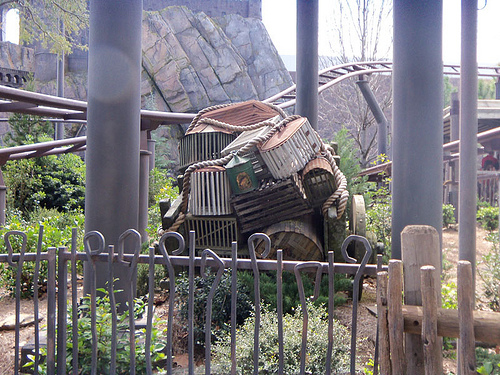 The Flight of the Hippogriff is a family friendly roller coaster ride in the Wizarding World of Harry Potter. This popular ride does have a height requirement of 36″ but it suitable for guests of all ages. The Flight of the Hippogriff is of course beautifully themed for the Wizarding World. The theme of the ride is that Hagrid is teaching all you wizards out there how to properly ride a Hippogriff. 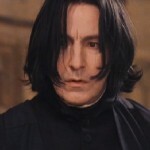 We don’t want to have the same encounter that Dracoy Malfoy did in The Prisoner of Azkaban! Every Harry Potter fan knows that to approach a Hippogriff and win it’s trust that you have to first bow when you meet it. You will hear Hagrid’s voice in the line instructing you as to the proper way just in case you didn’t know! 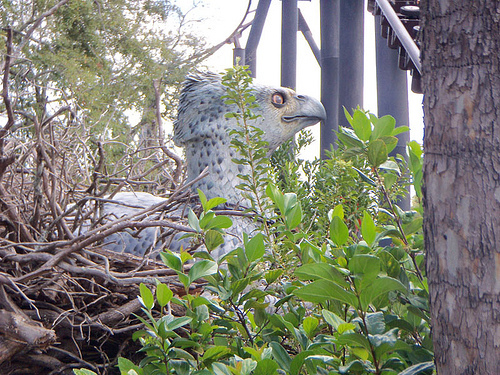 As with every area in Wizarding World The Flight of the Hippogriff is amazingly themed. The line takes you through the grounds of Hogwards, past Hagrid’s Hut and through the forest to the training ground for the Care of Magical Creatures class. The idea of the roller coaster is that you are taking a training flight on a Hippogriff over Hagrid’s Hut, The Pumpkin Patch where Buckbeak lives and the surrounding forest. This is your chance to meet Buckbeak face to face. The ride itself is a family friendly roller coaster ride. Nothing too scary on this 1 minute 6 second ride. The maximum speed is 28.5 mph so most guests, even those who don’t like the large coasters, will love it. Particularly the younger members of the group who are not tall enough (or brave enough) to ride on The Forbidden Journey attraction. The ride slowly climbs up the track and you get a great over view of the Wizarding World. 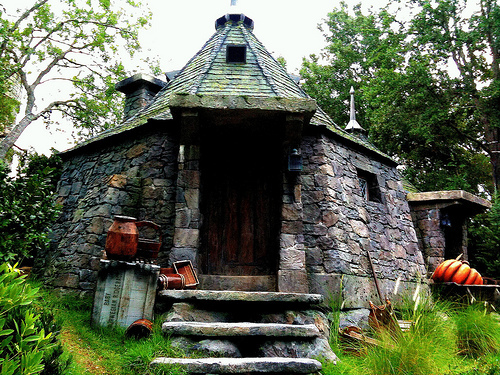 Then you are in for a thrilling ride with twists and turns over the forest, pumpkin patch and past Hagrid’s Hut. 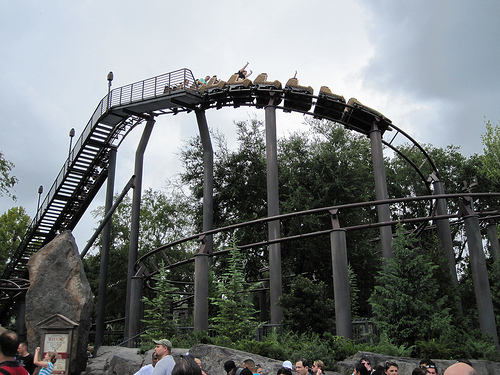 The Flight of the Hippogriff was not built for The Wizarding World of Harry Potter but was re themed from the existing Flying Unicorn Ride which opened in Islands of Adventure in June 2000. Of course it was prefect for a Harry Potter make over and the theme of the Hippogriff works very well. There is of course one down side to The Flight of The Hippogriff ride. The lines. It is slow loading and the line can get very long at times. The wait times are posted outside the ride. It does have an Express Pass so if you are prepared to pay the (sometimes very high) extra price then you will get into the express line and cut down the wait time considerably. The Flight of the Hippogriff is definitely worth seeing if you have young children in your party. It is my 5 year boy’s favorite ride. For that age group is is the only ride they can experience in Wizarding World. If your group is adults and teens you can give this one a miss. This attraction is fun but not likely to appeal to the teens in the group. As with all Wizarding World attractions if you want to beat the lines then arrive early or stay late. Use Express Pass if you have purchased one or are a guest at one of the Universal Orlando resort hotels.